The Washington State Council of Fire Fighters exists to provide education to our members and to advance policy and legislation that affects fire fighters and emergency medical personnel. Statewide issues that impact our members are our primary concern. 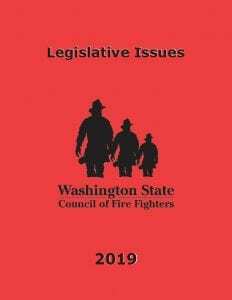 Every year, we publish a legislative briefing book that is used by members and staff to provide elected officials with a better understanding of WSCFF positions.